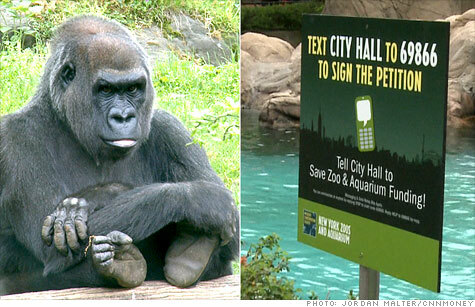 The Bronx Zoo could lose half its city operating support if Mayor Michael Bloomberg's budget cuts go through. NEW YORK (CNNMoney) -- Lions and tigers and budget cuts, oh my! The famed Bronx Zoo could lose more than half its operating support from New York City, under the fiscal 2012 budget proposed earlier this month by Mayor Michael Bloomberg. The mayor wants to chop $4.7 million from the zoo and the New York Aquarium, both run by the Wildlife Conservation Society. Cuts of that magnitude could have a major impact on the zoo, the nation's largest urban zoo, according to the society. In an e-mail plea to the public Wednesday, society officials wrote the reduction could force layoffs and program cuts. "We're at a tipping point," John Calvelli, a society spokesman, said in an interview. "Everything is on the table." Though he declined to specify who and what could be hit, he pointed to what the society had to do in early 2009, when its budget was slashed by a half-million dollars. It closed three zoo exhibits, including the World of Darkness, and cut the society's staff by 186 positions, or 15%. "We had to make some difficult decisions," Calvelli said. "We don't have the luxury of firing our walrus." The mayor's office, however, said the city also provides an energy subsidy for the zoo and the aquarium. Including that funding, Bloomberg's proposed reduction totals 27%, or $3.7 million. No doubt the mayor is sending less money to the society, but the city is in a very tough financial position because of "unprecedented" cuts in state aid and reduced federal support, said Marc LaVorgna, a Bloomberg spokesman. "There is not a city-funded entity that is exempted from some funding reductions," he said. The Bronx Zoo is far from the only one seeing its public funding dry up as states and municipalities deal with the fallout from the Great Recession. Public zoos, which on average depend on government for 40% of their funding, have been laying off workers, cutting educational programs, reducing their hours and raising ticket prices. "Zoos across the country are tightening their belts," said Steve Feldman, spokesman for the Association of Zoos and Aquariums. The Smithsonian National Zoological Park, for instance, is looking at closing its Kids Farm this summer to contend with a half-million dollar budget cut from the federal government. But the Washington, D.C., zoo is hoping private donors will rescue the children's exhibit, which costs about $250,000 to maintain annually. And at the Minnesota Zoo, officials are waiting to hear how much state funding they'll lose this coming fiscal year. The zoo could be hit with a cut of as much as $1 million, according to some budget proposals. "It would certainly impact our ability to maintain all the programs and exhibits we offer," said Lee Ehmke, director of the zoo, which receives $6.2 million from the state. The Minnesota Zoo is planning to keep its seasonal butterfly exhibit shuttered and to raise ticket prices to cope with the cuts. It will also not replace staffers who retire, Ehmke said. In New York, the wildlife society's two institutions have already lost $1.6 million in city operating support since mid-2008. This funding, which accounts for less than 15% of its annual budget, is supplemented by ticket and concession sales, membership and private donations. The cuts would have been even worse had the City Council not restored some of the funding that Bloomberg wanted to eliminate, a rescue that could be tougher to pull off this year because of the city's fiscal situation. The mayor has also proposed laying off more than 4,000 teachers and closing 20 fire companies. "The magnitude of the proposed cut makes it harder and harder for the council to restore as much of the money, particularly in a year as difficult as the one we're in," said Jimmy Van Bramer, chair of the council's cultural affairs committee.